Citrix Workspace app now enables easier access to the content. The focus is to ensure that you have a delightful and integrated digital workspace experience. Users can now access their favorite and recently accessed files right from the home page of the new “Files” tab on the left navigation pane which provides access to files from within the Workspace app. Users will notice that the entire folder navigation from Citrix ShareFile is made available in Workspace app. We have also introduced universal search bar for Workspace app. Thus users can now search for their content in addition to apps and desktops right from the home page. 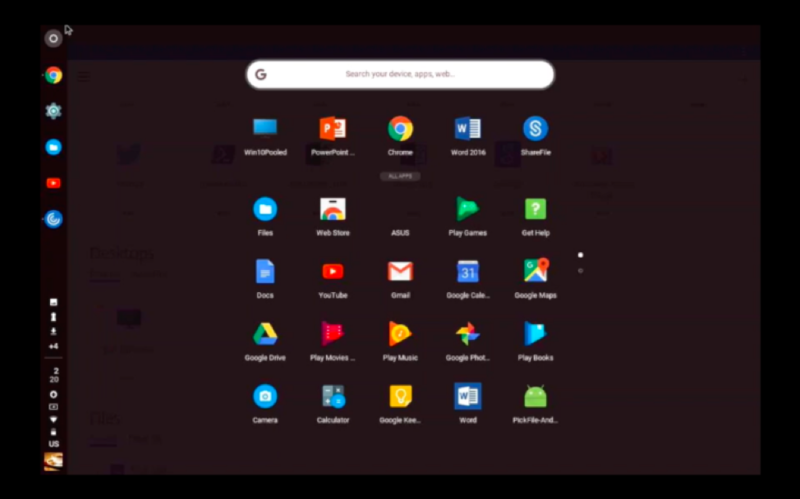 To give you more native-like experience, Citrix has built launcher integration for ChromeOS devices. All your favorite apps and desktops can be directly accessed from your Chrome Launcher. This is to enable quicker access to your favorite apps and desktops. For example: A clinician can now directly access his ERM published app from his Chrome launcher. In the below image you can see that the user’s favorite published applications and desktops such as Win!0 desktop, MS PowerPoint can now be accessed directly from the launcher menu. Citrix also supports the workflow where a file from your Chrome device’s download folder can be opened with Citrix Workspace app, which in turn opens the file with a published application based on the file type association of the file. You can edit the file and save it back to the downloads folder. For example: a user can now open a doc file from his downloads folder using a MS word published app from Citrix Workspace and save it back to the downloads folder. We also enhanced your experience on mobile phones with our Citrix Apps. Citrix Workspace app for Android on mobile phones, aggregates all the enterprise mobile apps using Citrix productivity applications like Secure Mail and Secure Web, thereby becoming the single store for all mobile applications as well. Citrix Workspace app for Android enables the workflow for enrolling and installing the mobile applications through Secure Hub. Any user can launch the mobile app from within Citrix Workspace app on mobile phones with single sign-on to Citrix productivity apps including Secure Mail, Secure Web & ShareFile. This experience is only for mobile phones and not supported on chrome devices. Excited? Then you’ll want to know how to transition from Citrix Receiver to Citrix Workspace app for Android on Chrome OS and Android OS. Citrix Receiver forms the foundation on which Citrix workspace app is built and provides secure delivery of apps, desktops and files to the end users. Citrix Workspace app will incorporate all existing Citrix Receiver technology, as well as the the seamless integration to other Citrix products and technologies. Citrix Receiver will be replaced by Citrix Workspace app, Citrix Receiver users will be able to seamlessly upgrade to Citrix Workspace app. If you are using Citrix receiver for Android then it will be seamlessly upgraded to Citrix Workspace app in the near future. We value your feedback as you research, test and deploy our solutions, so please share your thoughts in the comments below and through our customer support channels. To learn more about the Citrix, Google partnership, visit us at Google Cloud NEXT ’18, July 24-26 at the Moscone Center in San Francisco.